"This recipe has just 3 ingredients. It's fast, easy and the cookies are wonderful! It's great for kids that are just learning to bake." Preheat oven to 350 degrees F (175 degrees C). Line baking sheets with parchment paper. Combine the peanut butter, white sugar and egg. Mix until smooth. Drop spoonfuls of dough onto the prepared baking sheet. Bake at 350 degrees F (175 degrees C) for 6 to 8 minutes. Do not overbake! 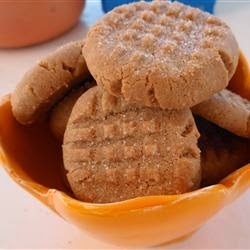 These cookies are best when they are still soft and just barely brown on the bottoms.